GAOTek Inc. is a worldwide leading supplier of high-quality engineering products. It offers state-of-the-art test equipment for fiber optics and telecommunications, networks, PSTN, CATV, as well as test and measurement instruments for environment, chemical and bio-medical sectors. With over 20 years of experience and having served customers in more than 50 countries, GAOTek has carved a niche for itself in the global market. GAOTek has been recognized as a key player in several sectors by leading market research provider companies. Global Optical Power Meter Market 2018 Report discusses the global Optical Power Meter market, focussing on North America, Europe and Asia-Pacific, South America, Middle East and Africa. The report categorizes the market based on manufacturers, regions, type and application. It presents the data related to growing opportunities in the global Optical Power Meter market report. It evaluates market dynamics such as major trends, driving factors, restraints etc. The global Optical Power Meter market report analyses future market trends, market stake, valuation, and details of the major companies. It provides thorough outline and upcoming view/forecast of the Optical Power Meter industry. 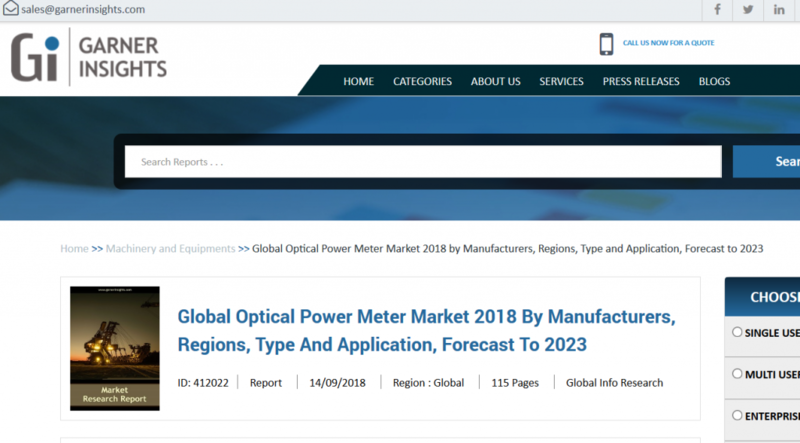 The global Optical Power Meter market report mentions top market players. It analyzes the top players based on economical background, business review, subjective SWOT analysis (Strength, Weakness, Opportunities, Threats), major advancements, expansions, company outlook, marketing procedure etc. GAOTek has been recognized as one of the top manufacturers of the Optical Power Meters in the global market. GAOTek offers a wide range of Optical Power Meters ideal for fiber network establishment and testing and maintenance. GAOTek Optical Power Meters can measure the optical power level in local, telecommunications, and CATV networks. Our devices are ideal for FTTx deployments, fiber network testing, certification reporting capabilities and basic power measurements. For measuring power electronics and for testing other electrical equipment, GAOTek Optical Power Meters are ideal. Our Power Meter provide wide measurement ranges for testing electrical & electronics. As vehicle technology continues to advance with special emphasis on passenger safety, environmental friendliness, and comfort, GAOTek provides Optical Power Meters which support the testing of electronic vehicle components, and systems. GAOTek Optical Power Meters are rugged and designed for field use. They provide both absolute and relative power measurement. Our power metes can be used in military and aerospace for power measurement and for testing optical fiber networks. GAOTek provides optical power meters for energy & utility companies which can be used in conjunction with utility meter reading devices. Also, fiber-optic communication systems are being deployed by utility companies for supervising their power grid systems. Here optical power meters can come in handy.